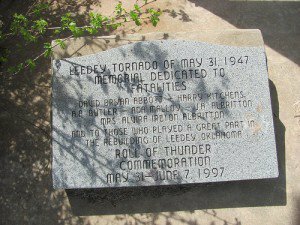 On May 31, 1947, a tornado ripped through the small town Leedey, Oklahoma, and killed six people. 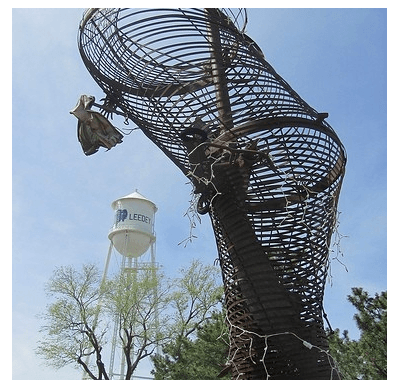 In 1997, the kids of the town (ranging in age from seven to eighteen) created the Leedey Tornado Monument in local art classes to pay tribute to those who lost their lives 50 years earlier. 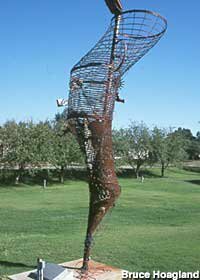 The tornado shaped sculpture, made of metal decorated with figurines such as a cow skull, rusty tricycle and a cowboy boot, stands proudly in the city park. Located in Leedey City Park on the south side of W 2nd St just west of Hwy 34/N Main St.